Sometimes in the frenzy, you fail. I'm not sure I'll ever get to the point of being excited about failure, but I definitely accept it as part of the learning process. Sometimes you may not have failed but you didn't succeed either. When we decided to join the Instant Pot cult, I indicated that you would be in on the comedy or errors that was likely to follow. 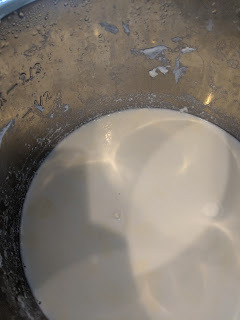 And true to my words, I have to give you an update on the first attempt to use the instant pot to make yogurt. Short story -- it didn't work. OK, that's not fair to the undoubtedly lovely people that recruit for the cult of manufacture the Instant Pot. It's not them, it's me. I have previously used store bought yogurt as a starter and after a few rounds of making yogurt, the culture died off. Part of the problem was likely that I wasn't able to control the temperature to the degree I wanted to and the Instant Pot performed adequately on that account. The other internet-based diagnosis gave an alternative. My bacteria lacked sufficient diversity. Since I was already getting the Instant Pot, I decided to go ahead and order an heirloom yogurt culture. Perhaps the better approach would have been to change one thing at a time so I could appropriately diagnose the problem and share relevant information with you. You're not that lucky. I checked the temperature throughout the process. The Instant Pot didn't do well on the "High" setting for yogurt. The display indicated that the temperature should go to 181 degrees Fahrenheit, my instant read thermometer put the temperature close to 165 degrees. OK - so I switched it to saute and set a timer for 5 minutes and closed the lid. That was a mistake, the milk foamed up and filled the Instant Pot which complained at me with a mystifying series of beeps that could only be understood by an advanced alien race. So I take it out and put it in an ice bath to get the temperature down to the 110 degrees to start the fermentation and I add in the dried culture. Then the "Medium" setting gave a temperature of 107 degrees. I decided to use "Custom" to set the temperature to 110 degrees. I then set the instant pot for the 8 hours that it will take to ferment. I measured the temperature throughout the fermentation process and the Instant Pot did a good job of holding at that temperature. And then... I get slightly tart smelling milk. To be fair, the culture said it was possible that the first time the yogurt would not set. So I put the "yogurt" in the fridge to cool down. I'll run a second round with new milk and let you know how it goes.